This is a rare example of a construction inspired entirely by a competition specific for a given community. 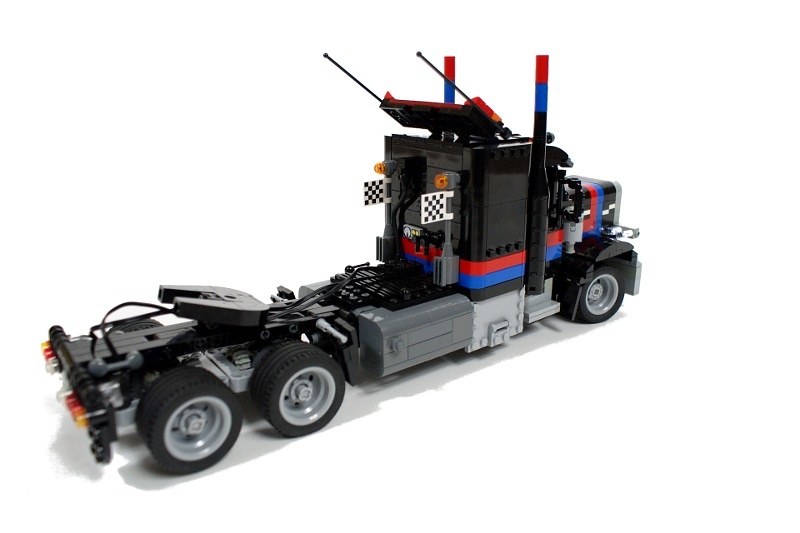 Namely, it was inspired by the Hard Truck Contest invented and successfully introduced by the DoubleBrick community. 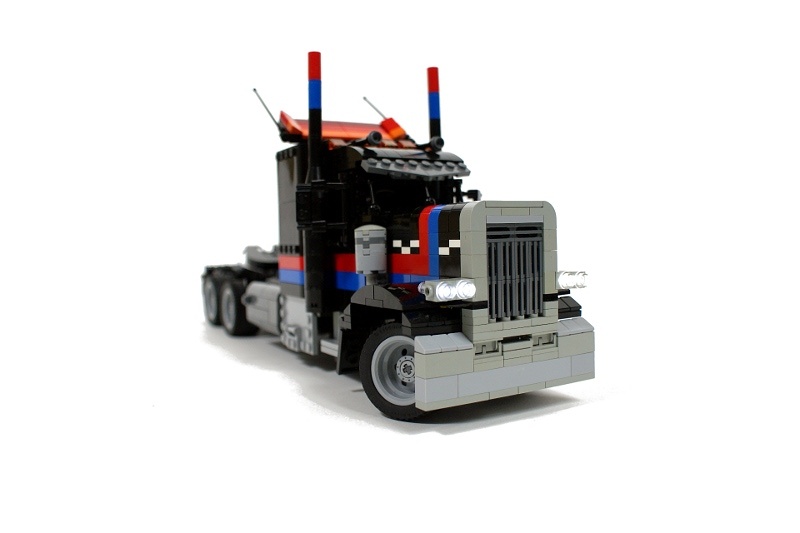 The exact description of the contest can be found via respective link, it suffices to say that the contest brings together small models of trucks (usually 14 studs wide), built with an accuracy and attention to details that make them a wonder to behold. I’ve spent some time watching the videos from the HTC races not to follow the course of the competition, but to simply enjoy the view of the beautiful models. 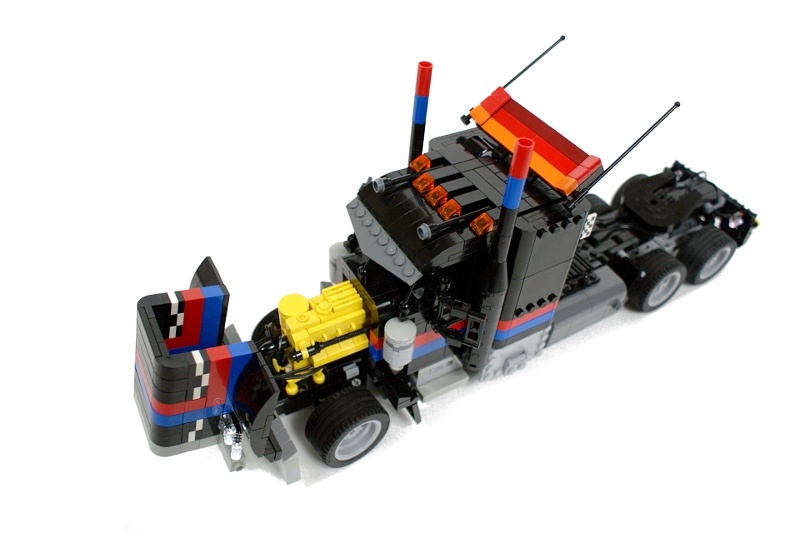 I was hoping to get the builders from my country interested in similar races, and the best way to get their attention seemed to build a prototypical vehicle. 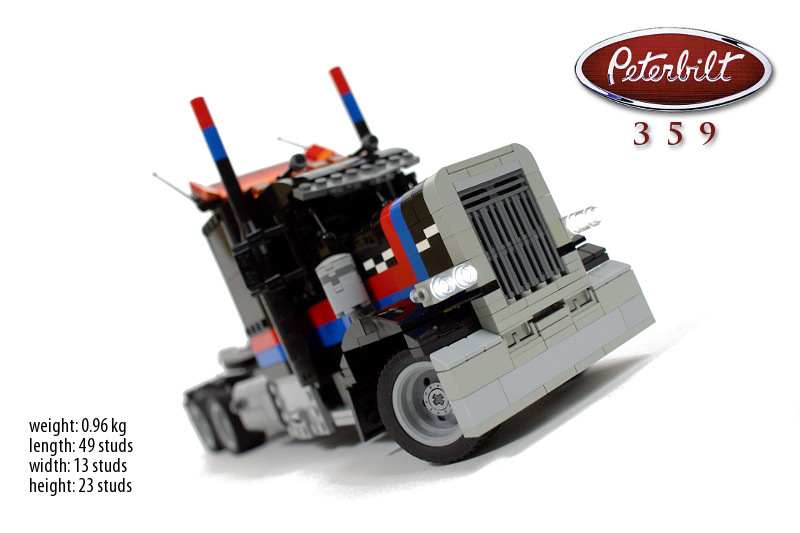 Having previously built model of the Kenworth W900, I have chosen another one of the most iconic American trucks, the legendary Peterbilt 359. 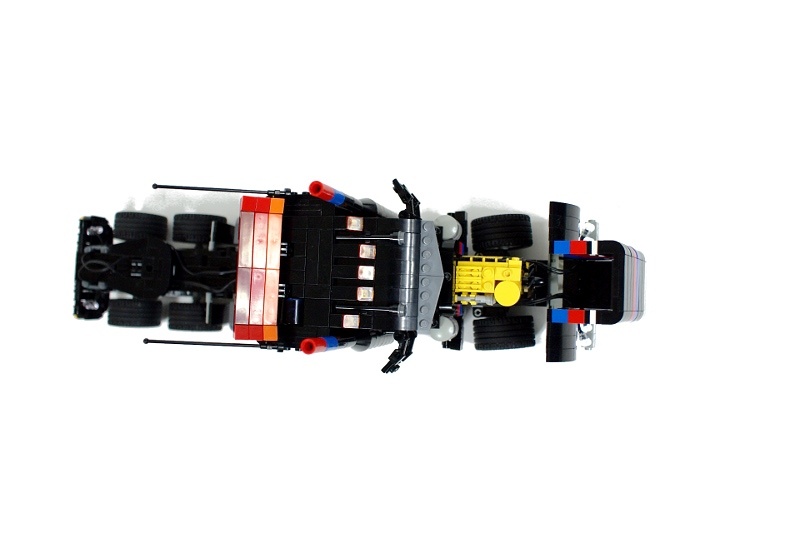 When scaled accordingly to the size of the wheels used in HTC races, it turned out to be just 12 studs wide. 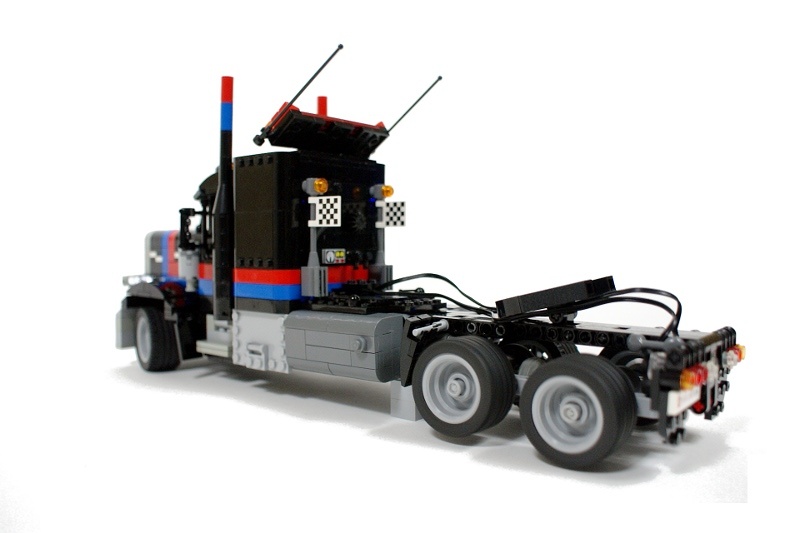 The original HTC vehicles are 14 studs wide – I don’t know the reasons for which such a standard was accepted, perhaps it was simply more convenient or based on trucks with different wheels size, but I decided to take the challenge of building a 12 studs wide model. 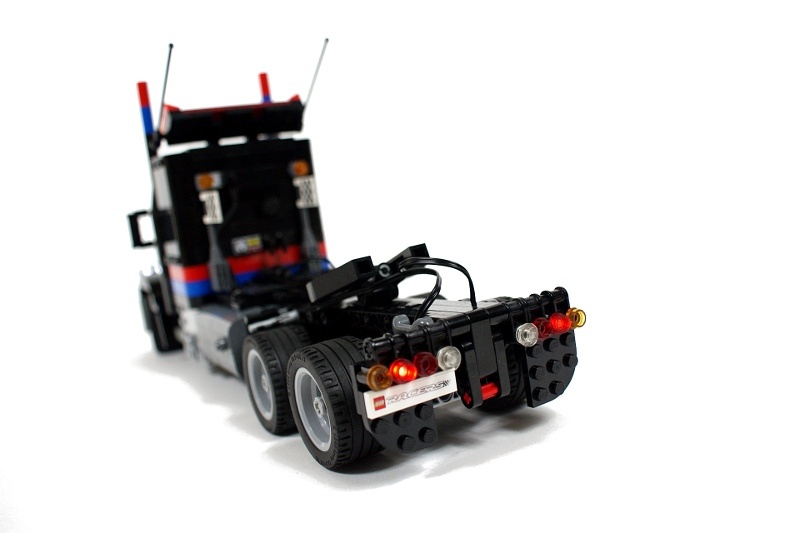 And it was quite a challenge – it was my goal to use identical wheels on all axles, which meant that I only had 6 studs of width available to make the front axle steered (original HTC trucks often use narrower front wheels). 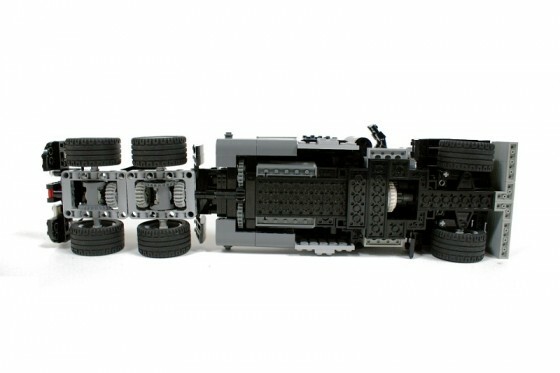 As the idea of making the front axle suspended seemed mad, I focused on the rear axles’ suspension. Since the axles are based on the 5×7 open liftarm frames with differentials inside, it was natural to make them pendular. 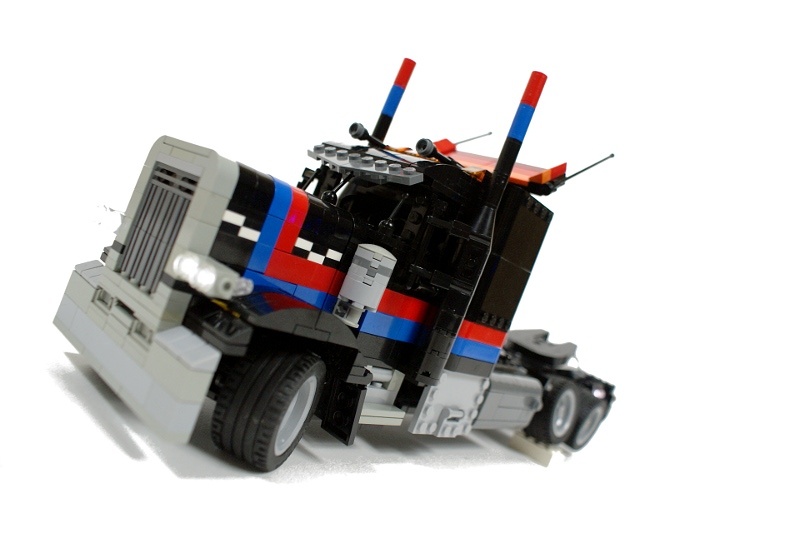 Concerned about the truck’s stability at high speeds, I have used rubber axle joiners as the suspension stabilizers – they were simply attached to the truck’s frame above the rear axles, and acted as shock absorbers whenever the suspension changed its angle. It should be noted that it’s an obvious solution to use some sort of a simple supporting structure between the frames of axle #2 and #3, but I wanted to model the original wheel span, and the model was simply too small to add an extra space for such a structure. 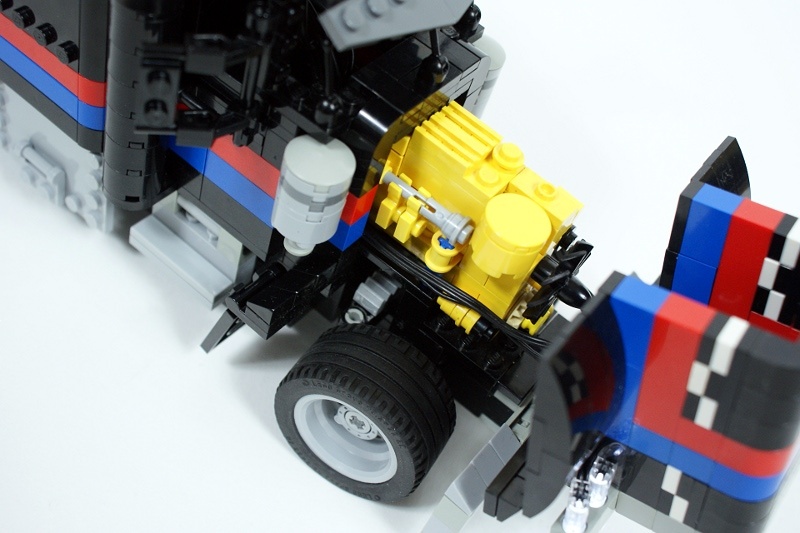 It has slightly degraded its performance – the driveshaft connecting axles #2 and #3 is being pressed by the truck’s weight, and hence the truck is somewhat slowed down. I have started to built this model with its both ends, separately with front and rear axles. It resulted in an uncommon frame design – the front half of the frame is purely brick-built, while the rear one is 100% liftarmic. 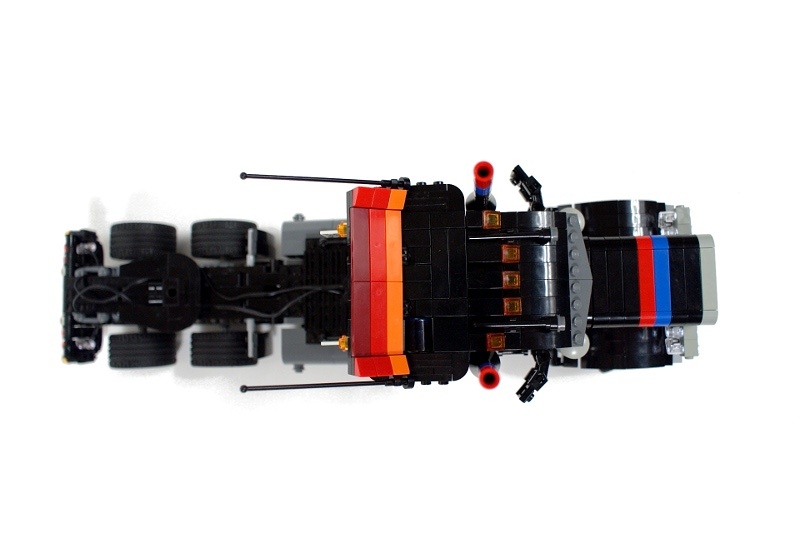 Both halves are connected under the sleeper module, but the rear half lacks the stiffness typical for bricks. 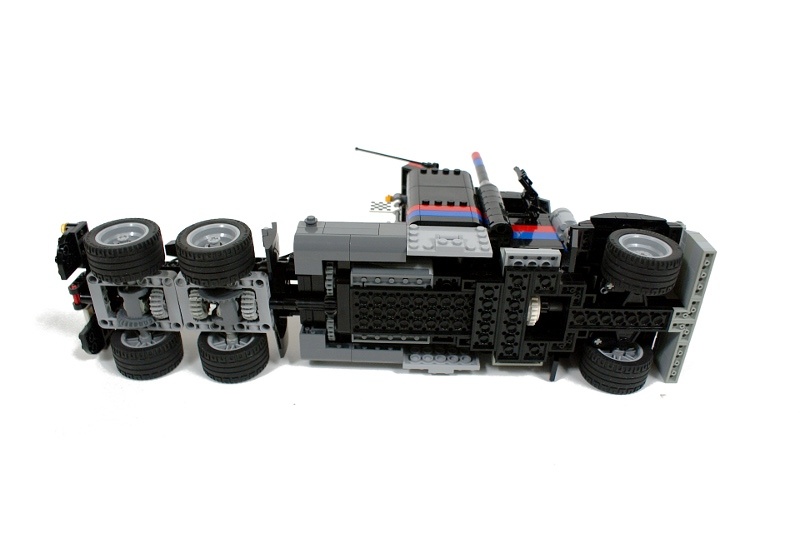 The chassis design is pretty typical – both drive motors are located in front of the rear axles, and the steering motor is located behind the front one. Due to limited length of the chassis, I have used a 71427 motor for steering. It’s located below, and partially inside the cabin, while the drive motors have been hidden under the mock-ups of the side fuel tanks. The final drivetrain’s gear ratio is 1:1.43. Extra attention was given to the bonnet – I wanted it to be openable and to have a model of the engine underneath it, just like I’ve seen in the original HTC models, but I also wanted to take one more step and use PF lights in the headlights. 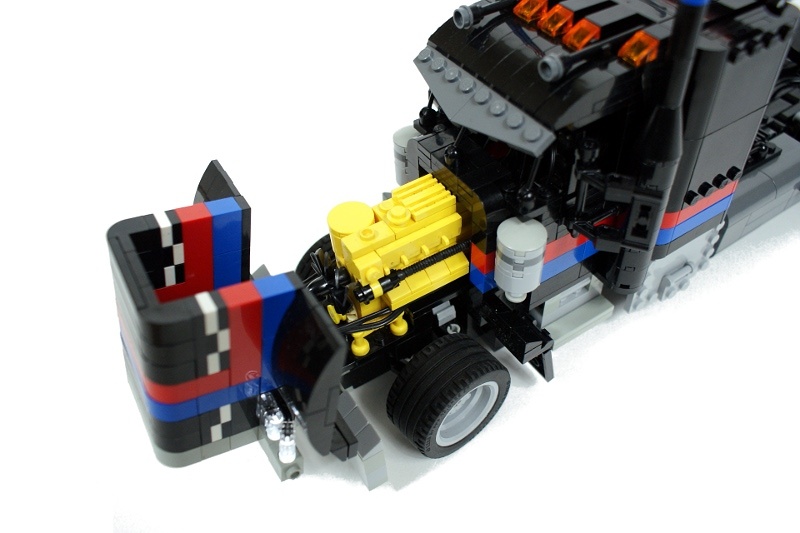 It was eventually achieved by resizing the bonnet’s width from 7 to 6 studs. This is wrong in terms of the scale, but it makes the bonnet much more structurally solid. I have deeply enjoyed building this model – perhaps partially because it took just roughly 4 days to complete. It was a valuable experience, showing that e.g. 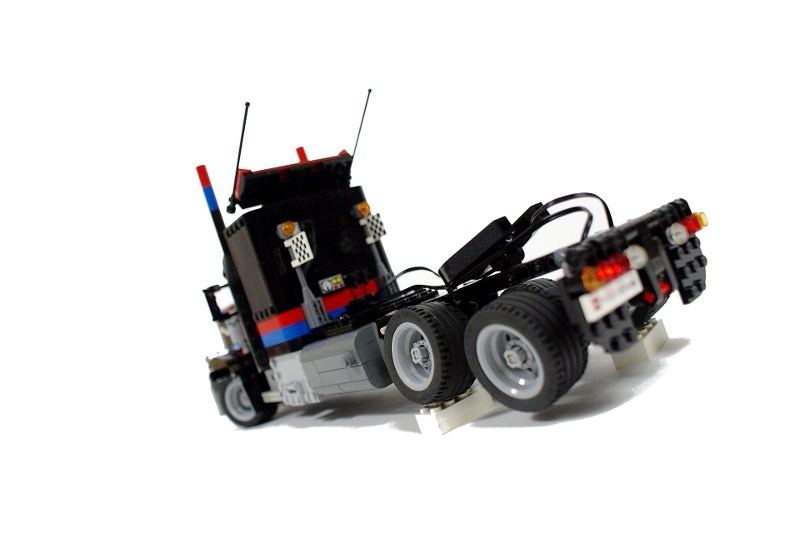 brick-built exterior may look pretty but is quite heavy – this is a really small model, but it weights almost 1 kg (just to give you a point of reference, 1 kg is a minimum required vehicle’s weight according to the rules of Polish Truck Trial). Still, it was reasonably fast and fun to play with, despite its pretty limited functionality. Because it’s not impressive, probably less than 10 kph. It only seems very fast because it’s so small. 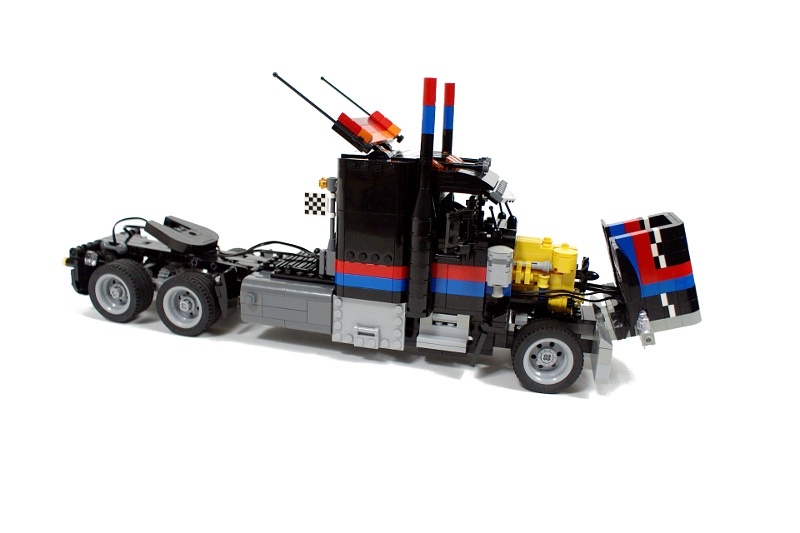 What’s the top speed of this truck, it’s incredibly fast! 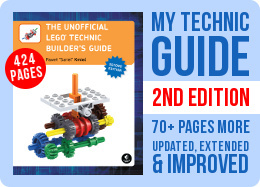 Hey, I cannot, for the life of me, find the piece you used to hold the differential module in. The gray piece that is rectangular. 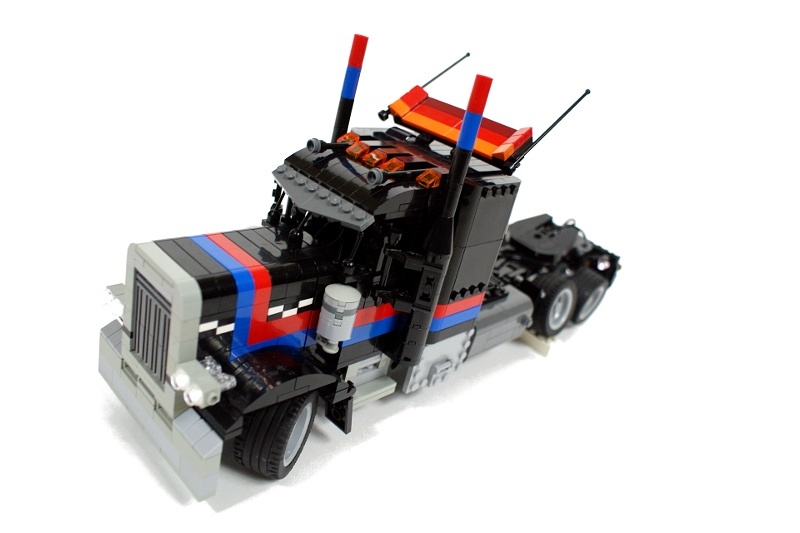 If you could link me to the bricklink page for it I would be very thankful. Yes thank you for your help, I couldn’t find it. 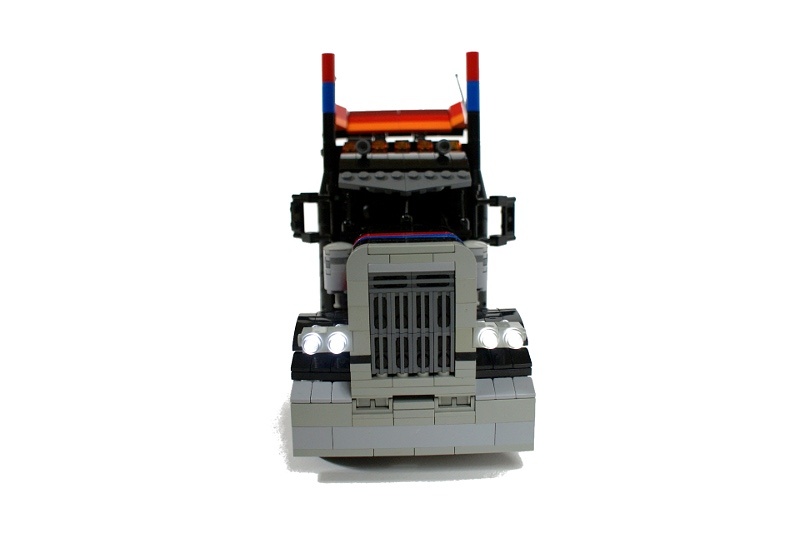 Can you give me a link to the round/ slope part you have used in the front of the truck? You have used two blue, two gray and two red. 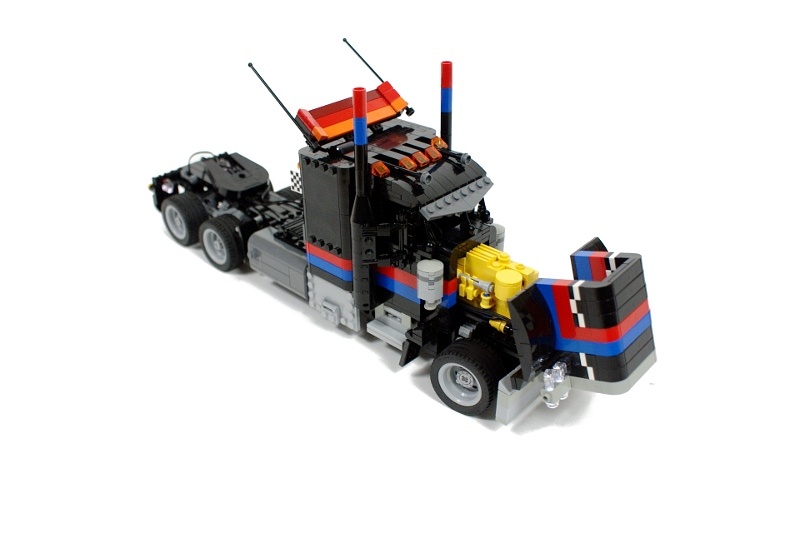 I can not find them in Bricklink. I guess it could if I removed the tires from the rear wheels, but I haven’t tested that. 1. I can, but it’s extremely simple, just a couple of pieces put together. 1. 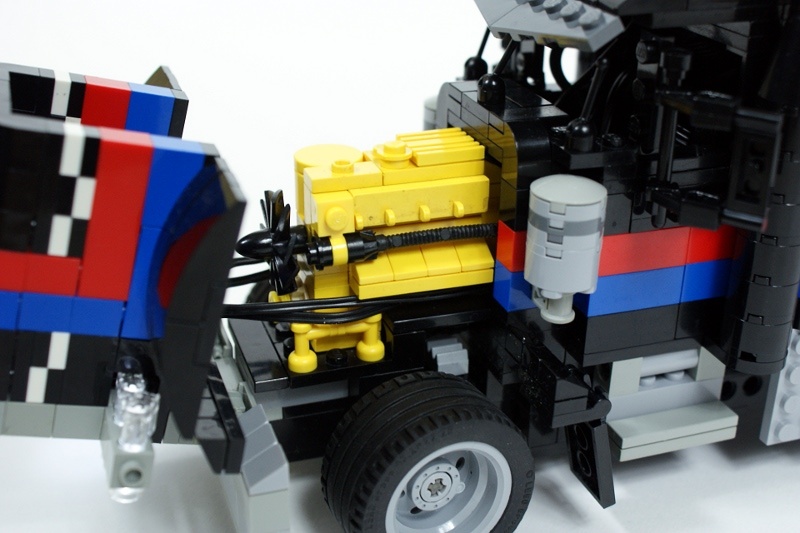 Could you create a replica or an MLCad file of the steering system and post it here? 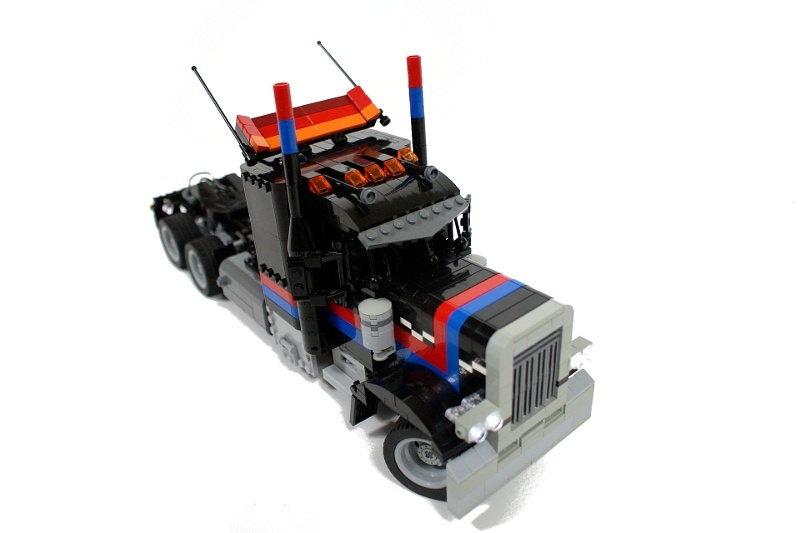 I am making a similar truck but the steering is never strong enough. 2. How did you join the back and the front together with the 1 stud difference? where do u buy the lego peices?..if its possible can u tell me where?.. Well, mainly because there are no HTC races in my country. Russia and Poland are not so really close, in case if you missed it. Did you actually enter it in the HTC races,if so where did you come? It’s way too small, and even if it was bigger what would it need a diff lock for? It’s not an off-road truck. Does it have a diff lock,or was the truck to small? I just have a good feeling of it, that’s all. I can steer it so accurately with a regular PF handset and no special mechanical tricks whatsoever. 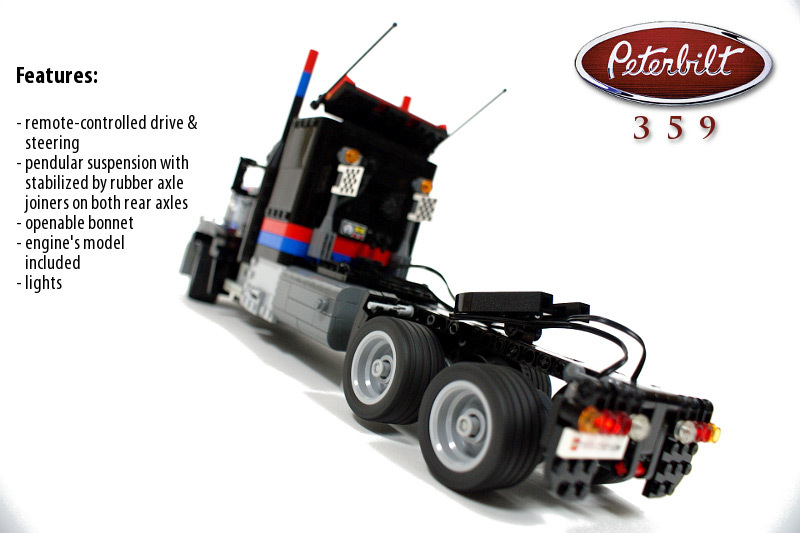 How do you steer so easily while the truck is moving and how does the steering goes back in the middle? I tried the elastic to make it return to the middle, it takes a lot of time. It’s 2 studs shorter, as I pointed out in the description. They’re smaller for a start. 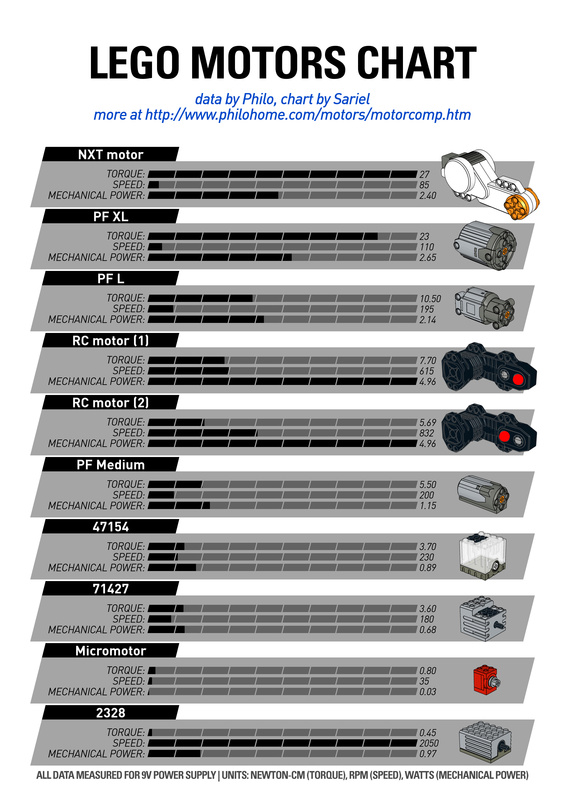 Is a 71427 motor better, or why do you use so much of them? Yes, and what you need is an extension wire. Got it? Nice! It is a challenge integrating a fully working system into such a small area – particularly witth your concern for aesthetics. I’ve watched a video on this HTC. It’s incredible! I think the real challenge lies in making a working model so small… wow. I have 13×24 but they are among the ugliest LEGO wheels I’ve ever seen. The Truck looks cool and drives great. But i have one Question: You had used the same tires at every Axle. Did you make it for better Grip on the Front Axle or have you no 13×24? No, it’s too slow for that. Mam tylko jedno pytanie- jaka przekładnia napędza układ sterowniczy? W moich modelach zawsze mam ten problem. Nope. You mean the adder mechanism – it’s a good idea to use it to couple two motors together, but I simply had no space for it here. 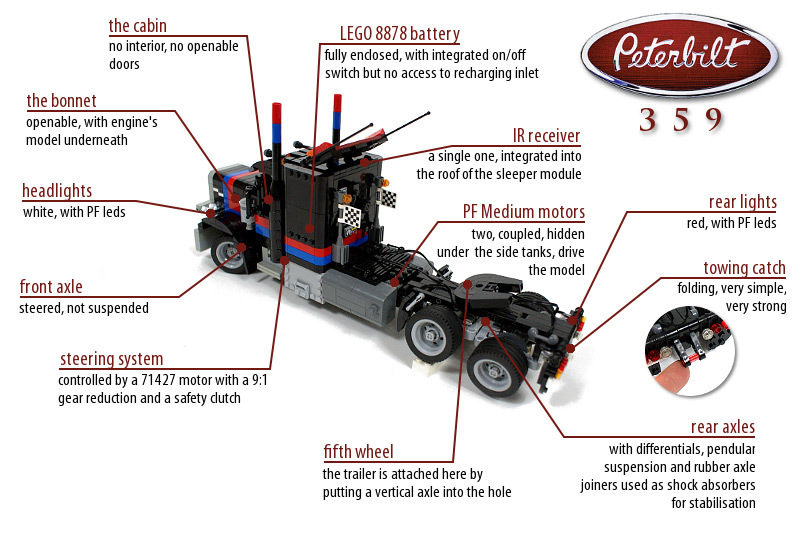 I have a question: The whole truck is driven by 2 PF medium motors, isn’t it? Don’t you use a differential between them? 4 days? such a good model for such a short time. But, again, another brilliant model. And what is that epic music? One PF M motor is not enough for this Weight of model i think. To sum up their torques and thus get higher speed. Why use two motors for driving? your note about how this model was built to interest the polish tt community struck a chord with me. at the moment i’m considering doing something similar in the us with an entirely new type of technic racing. the concept is this- unpowered, steered vehicles designed for descending hills and rough downhill terrain. the winner would be the person with the lowest time over a section. there would be few regulations, excluding vehicle dimensions. the goal is to get the speed of indoor and rally racing without the wear on parts. im designing a prototype at the moment, and if the tests look promising then i’ll take it to a baylug meeting. 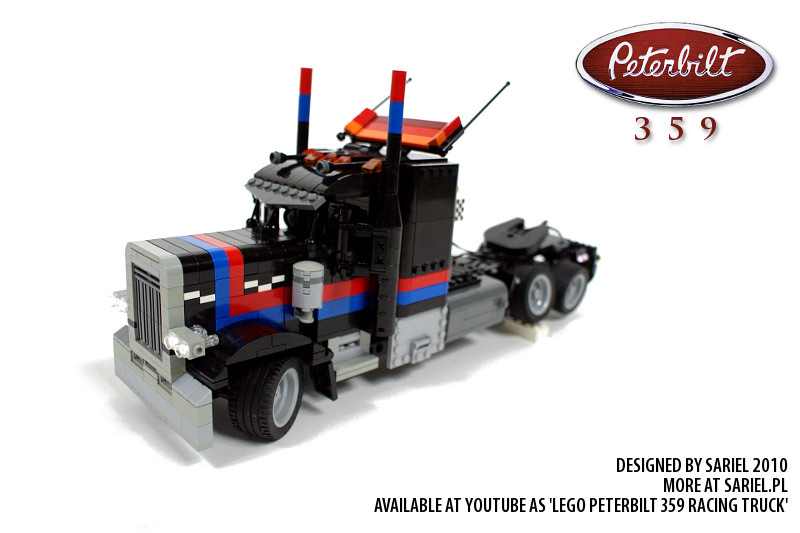 As always, another fantastic MOC! If TLG ever sold a set like this, it would be wildly successful. Let us know if your countrymen take up your challenge to have “Hard Truck Trials” in Poland!